Starbucks Banana & Walnut Muffin Copycat Recipe – deliciously easy jumbo banana and walnut muffins that are light, airy, moist, and bursting with banana and walnut flavor! 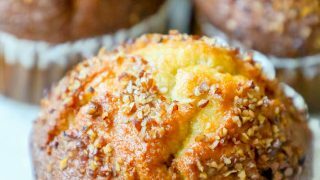 These easy banana nut muffins taste just like your favorites from Starbucks – and go from the pantry to the table in less than 30 minutes! 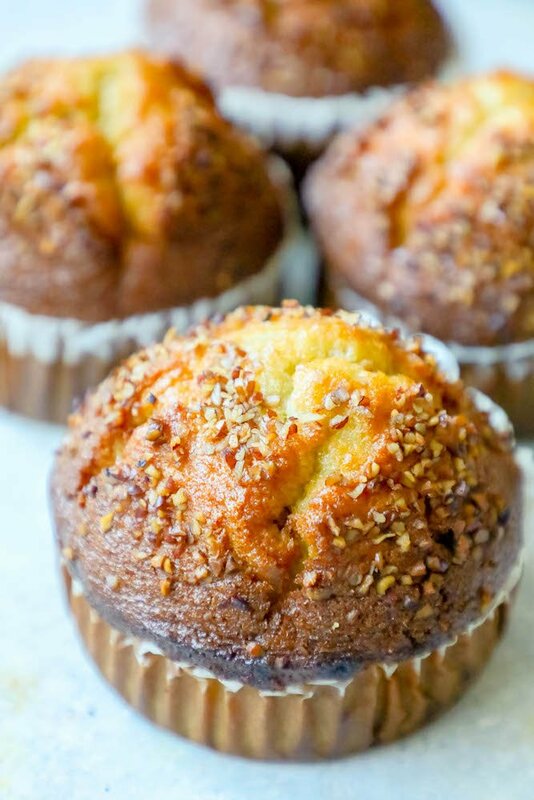 You will love these delicious perfect banana nut muffins – they are moist, sweet, a little crunchy, and to die for delicious. 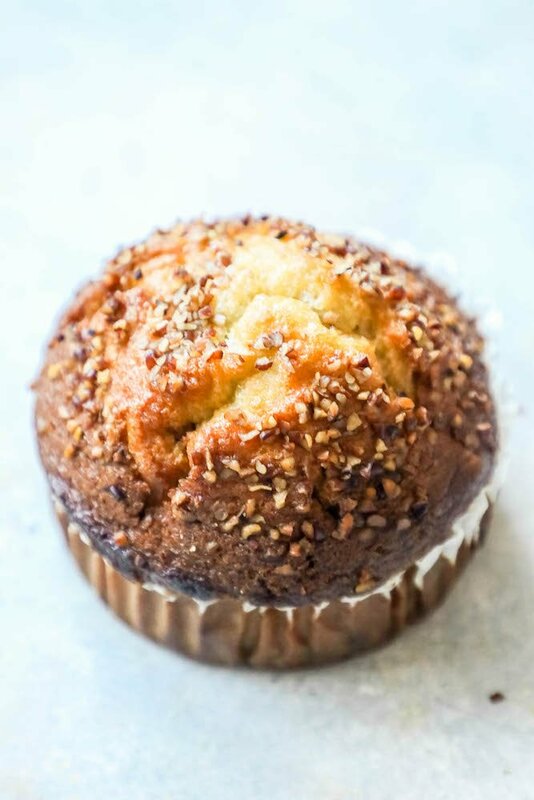 I hope you love this banana nut muffin recipe as much as I do! Just Take Me To The Best Banana Nut Muffins Recipe Already! I get a lot of comments and questions on my site, so I try to put in as much information as possible into my posts for my readers. 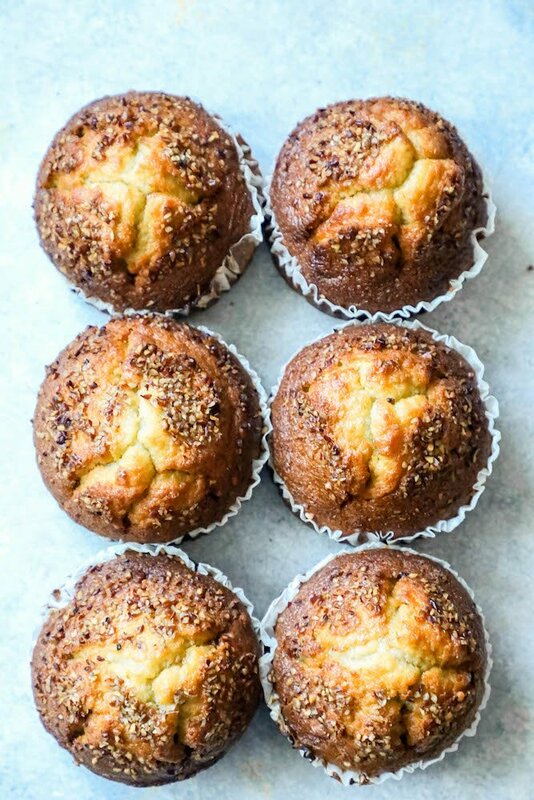 If you’d like to skip over the tips and tricks to make these easy Starbucks copycat banana nut muffins, please scroll to the bottom of the page. First off, pick a recipe with baking powder – not baking soda. Baking powder gives muffins a nice lovely lift, whereas baking soda gives a good spread. Use a double acting baking powder – double acting powder starts to work the second it touches liquid, helping your muffins rise before they are even in the pan. Overmixing muffins can make them tough and dense, not puffy, light, and fluffy. Using room temperature butter makes muffins easier to mix – especially creaming the butter and sugar together – and helps reduce the chance for over-mixing. Room temperature butter is my favorite to use in muffins for the perfect texture and lift. If you have one, use your stand mixer with a good scraping paddle. Make sure all ingredients are evenly incorporated (no lumps and chunks of butter or flour) for the best lift. Resist the urge to mix too fast – go slow and mix well, instead of overworking batter. Oven temperature is one of the most important things to determine the lift of your muffins – it is the difference between light and airy muffins and short, dense muffins. 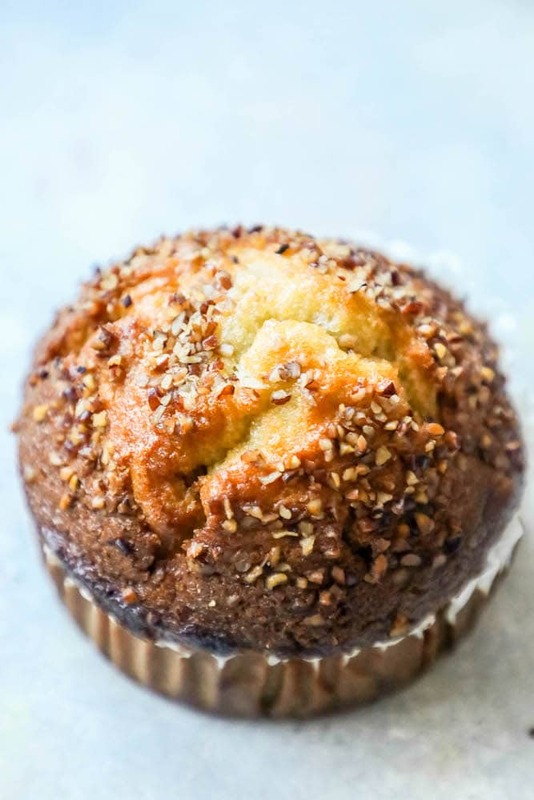 If you love these easy and delicious Starbucks Copycat Banana Nut Muffins, be sure to check out some of my other favorite easy and delicious recipes below. If you love this easy Starbucks Banana and Walnut Muffin Copycat recipe as much as I do, please give it a five star review and help me share on facebook and pinterest. In a large bowl, combine the flour, baking powder, and salt; set aside. In a stand mixer with a paddle attachment, cream butter and sugar together. Add in banana and mix well to combine. Add eggs, and vanilla and beat well, scraping down the sides of the bowl once or twice to be sure everything is mixed well. Mix in the dry ingredients and chopped (not diced) walnuts, just until incorporated. Spoon the batter into the muffin tins to fill them about halfway. Sprinkle the tops with finely diced walnuts and raw sugar. Let cool for a few minutes before turning the muffins out. Serve warm or at room temperature with lots of butter! I need to make these!! They look amazing! 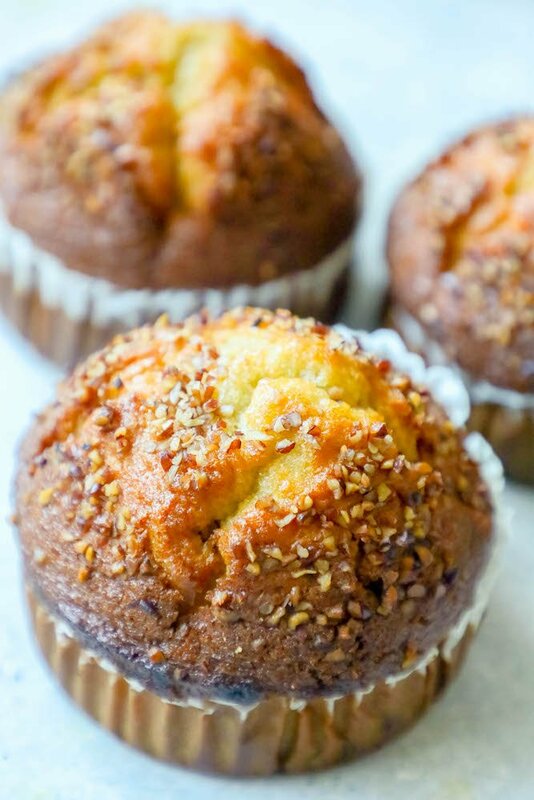 Banana muffins are one of my favorites & I love the added crunch from the nuts. These look soooo tasty! Even better than Starbucks! Best muffins ever! My whole family loved these! I am so excited to make these! These are my favorite! These taste just like what you’d get at Starbucks! Great recipe, thanks!